the king of Midhope Moor. but today, I’m heading for the top. now there is nothing but open moor. I follow a ruined wall over the gently rising bog. looking for the easiest steps. sinking into moss and peat. a hop, a jump, a squelch. the bog concedes to rock. broken tooth crown around its head. by the clashing howl of wind. surges of wind push me back. collection of stone that began in the Bronze Age. colour draining in the half light. picking and sliding down the steep sides. 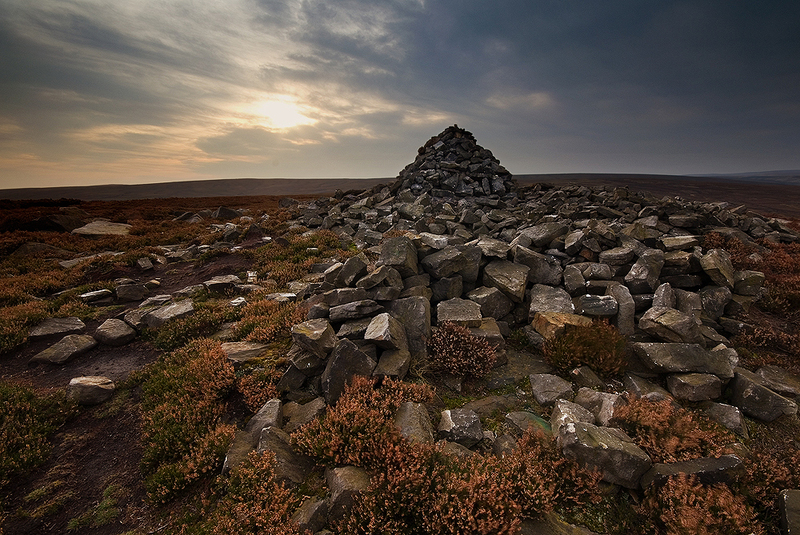 This entry was posted in Peak District, Poetry and tagged midhope moor, moors, peak district, pike lowe, poetry by andyhemingway. Bookmark the permalink. Your photographs always blow me away Andy, it is the way you catch the early morning light that wows me. And the poem compliments it so well. Perfect!